Did you know the month of May is National Bike Month? This week (the 16th-20th) is also Bike to Work Week and on Friday, May 20th, it’s Bike to Work Day! What a great excuse to get outside and ride your bike! I’m not exactly the biggest fan of exercise. My poor husband has been trying to get me to go running with him since we were juniors in high school. Poor guy. One form of exercising I’ve ALWAYS enjoyed, however, is riding a bike. I remember spending most of my childhood riding my bike everywhere with my friends. So I’m particularly excited about this month and the excuse to get back in gear (pun intended) and get riding! Who’s with me?! I don’t think I’ve ridden a bike since before I had my little one. Not to say I haven’t wanted to. I’m a stay-at-home mom and sometimes finding the time (and motivation!) to get out and exercise can be challenging. My husband is an avid biker so I really wanted to take on the challenge for Ride Your Bike Month to get back on a bicycle. I started to look for ways that I could make it work with my little one because I knew, through experience, that I just wouldn’t get out any other time. I figured I needed to make this work while my toddler’s awake so we can enjoy it together. That’s when I discovered this little beaut. It, a long with my bike, just arrived a few days ago and we are already more than thrilled about it! You can’t really tell because the sun was in his eyes but my toddler was so giggly every time we got going. 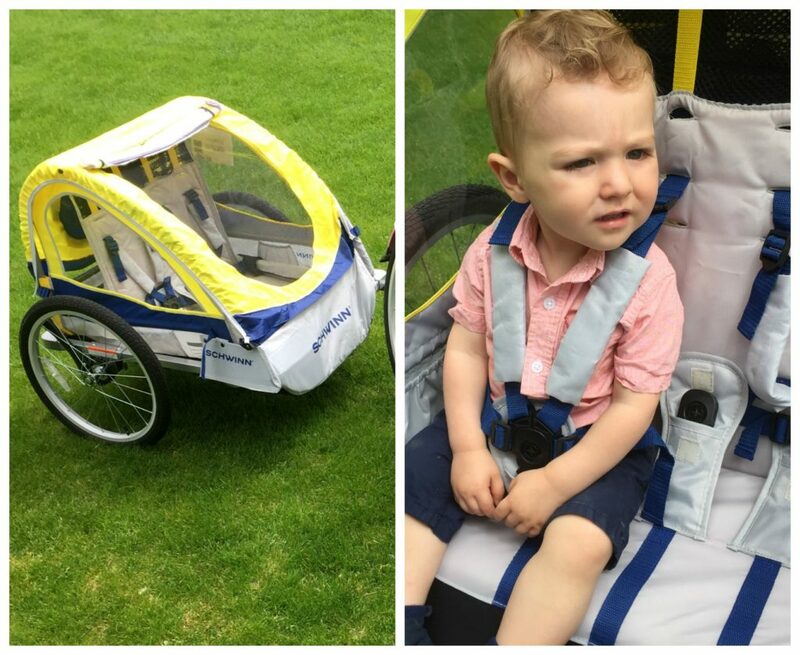 It’s created such a fun way for me to get exercise and my little man to get some outside time. If you don’t already have a bike and are now wishing you did, mine is a Schwinn Carington, which you can find at Toys R Us in a couple of different colors (blue, pink, purple), or you can look through a bigger selection of Schwinn bikes on Amazon! The trailer is an InStep Double Trailer and it has a nifty bug screen and weather shield to protect you child from any bugs or unexpected showers (or sprinklers!). We have seriously LOVED it and are so excited for all the adventures it will bring us this summer! 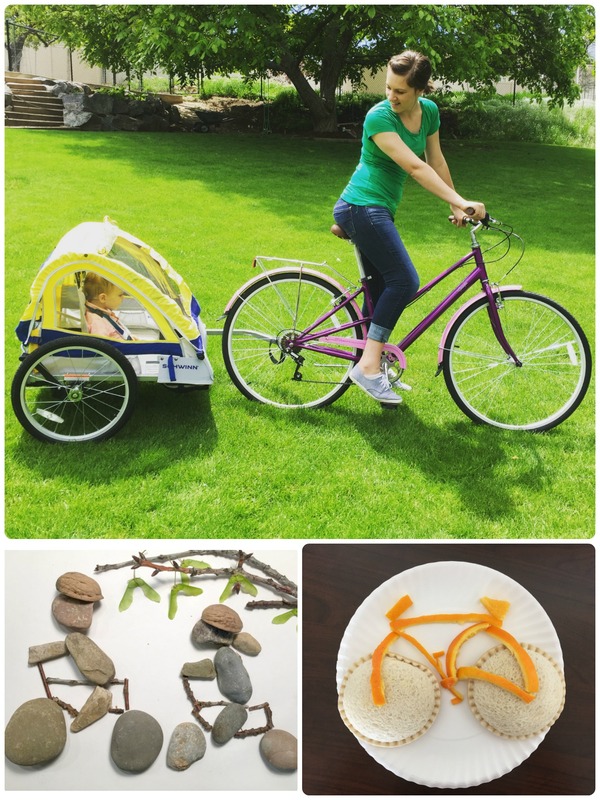 In honor of National Bike Month, we’ve tried to incorporate bikes into a few of our every day things. 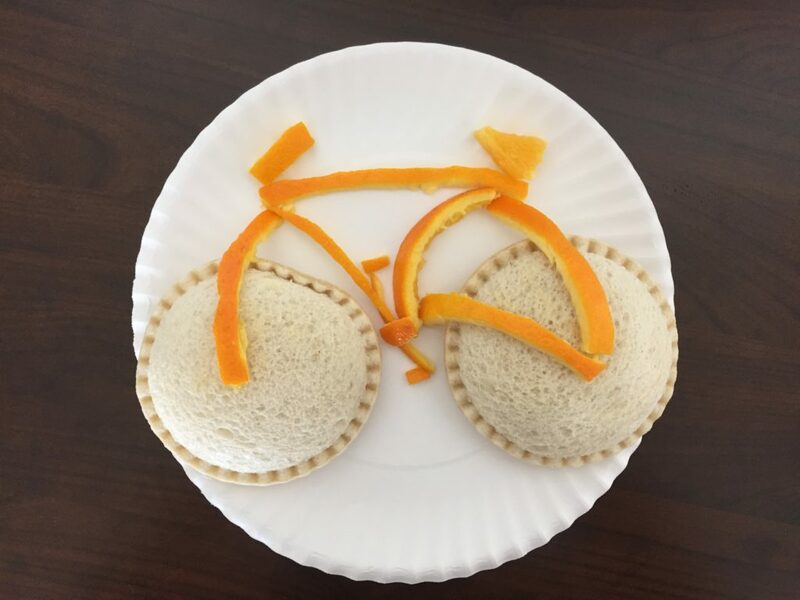 For lunch time, I turned my son’s sandwich into a bicycle design with oranges. 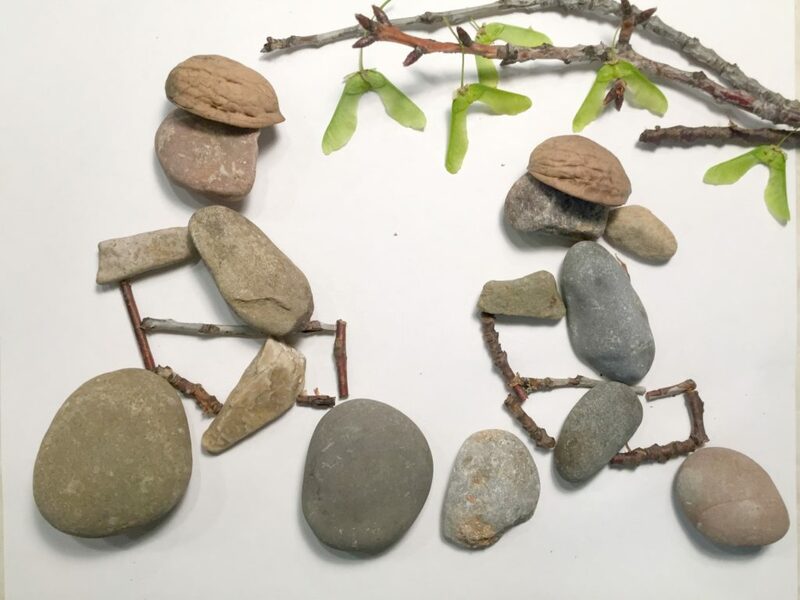 For our little activity my son loves collecting rocks every time we go outside, so I grabbed a few of his collected rocks and put together this fun little art project. Obviously you don’t have to go crazy to have a little themed fun with your kids. I didn’t end up buying anything extra for either of these, I just threw together what I already had around my house and it was a fun thing to do. . . while my son watched (haha, I can’t wait until he’s a little older and can participate more in my made up activities. . . He did have fun collecting those rocks and eating his sandwich though 😉 ). It’s not too late to celebrate National Bike Month! 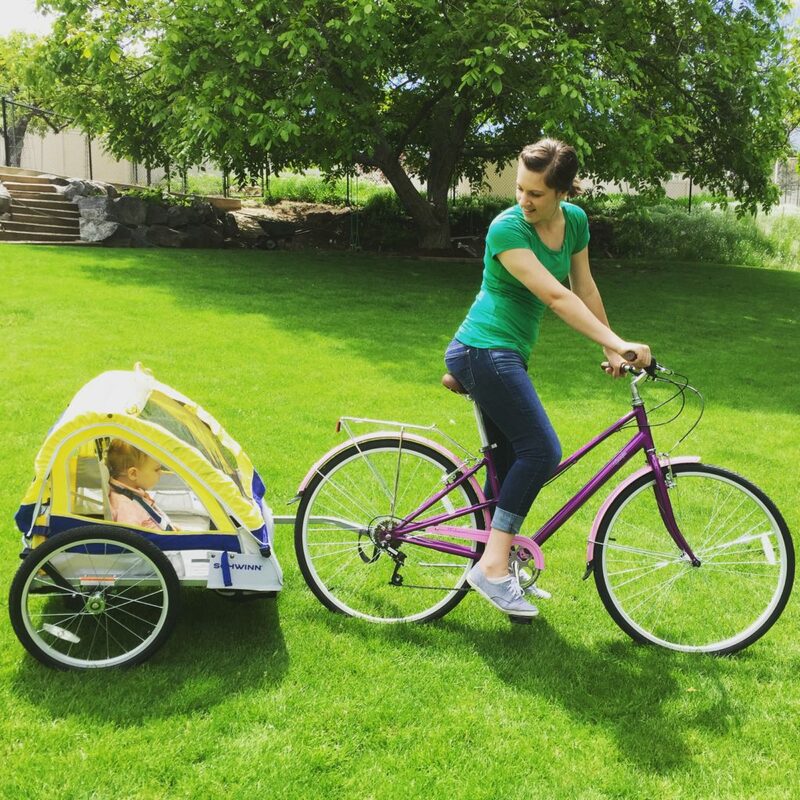 Clean off those dusty bikes in your garage (or be like me and get a brand new, shnazzy looking one) and go for a bike ride as a family and enjoy some exercise and the great outdoors together.